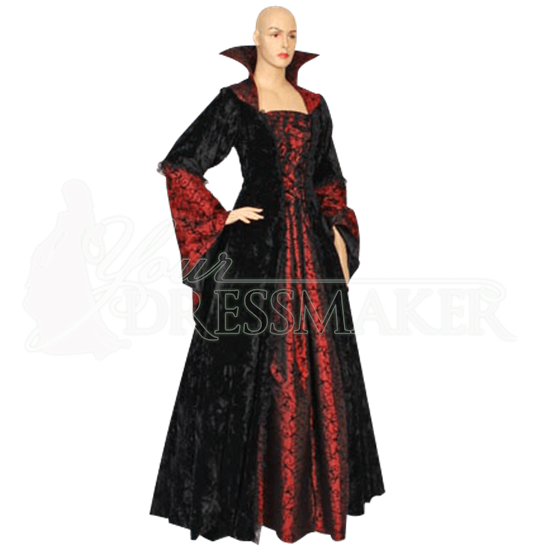 For an elegant and beautiful gothic look, nothing can beat the Countess Dracula Dress. This absolutely beautiful dress is made from high-quality black and red fabrics and fastens with laces on the front and back, making it highly adjustable. This dress is made from heavy-weight crushed velvet and ornamental taffeta fabrics, making it incredibly soft and extremely luxurious. The dress is primarily black crushed velvet, while the front is decorated with a vaguely hour-glass shaped segment of red taffeta decorated with black ornamentation. This dress also features a high collar, also made from black-ornamented red taffeta. The full-length sleeves are bell-shaped, being fitted from shoulder to elbow and flaring gently from elbow to wrist, where the sleeves comfortably hang, from shoulder to elbow the sleeve is black velvet while the rest of the sleeve is the decorated red taffeta. The Countess Dracula Dress is pictured here being worn with a petticoat, which gives it that shaped, slightly flared appearance towards the hem, the dress itself does not include a petticoat, so if that shape is desired then a petticoat or hoop-skirt can be purchased separately. Also please note that the dress does not include the pictured cape, either. The beautiful, darkly gothic Countess Dracula Dress in black and red is an absolutely stunning outfit that can be put to a multitude of uses: use it as a medieval dress for a gothic noble or use it as an elaborate and fancy Halloween costume fit for any vampire-queen.